Mother’s Day is a few weeks away. Do you know what you are going to give your mom this year? My mom always wanted simple Mother’s Day gifts – things that we made as children or that would hold a special meaning to her. Handcrafted gifts that were gift wrapped with love were much better than anything store bought in her mind. I also enjoyed when my daughter’s would make me something that they were so proud to give me. Those gifts are the keepers – the ones I could never part with. I have made quite a few items that would make great gifts here on my blog that I think a mom will love, especially if you put her style on it. I also love to think up pretty and stylish ways to gift wrap any present – presence! I have rounded up a few of my favorites Mother’s Day gift ideas, along with a few ideas that you can buy if you don’t have the time to make anything. My sister has a letter holder on her kitchen desk. She loves how nice and organized it keeps her stuff, but she didn’t like the color and pattern on it anymore. As a surprise, I gave it a fresh new look, simply by painting it with DIY chalk paint. No need to buy a quart of chalk paint, most craft store sell small bottles of chalk paint nowadays in a wide variety of colors. If you can’t find a color you like, simply make your own using this DIY chalk paint recipe. Crafts stores are filled with new items that can be repurposed into something other than their indented use – like this acrylic box frame. When you remove the cardboard insert and turn a clear acrylic box frame upside down, you get a modern looking tray. Line it with stylish gift wrap and your mom will be squealing with delight. If a bar tray is not her style, make it into a vanity or serving tray. Make mom feel like a 5-Star Chef. Give her a personalized chef’s coat. Have it monogrammed with her initials, name, or nickname. My local uniform store carries the coats and embroiders them for a nominal extra charge. To find one in your area – simply Google search for “uniform stores in my area”. Isn’t it…Oh! so clever? A chic tote to carry wine to a party. It comes with a cooler pack inside to help keep whites and roses chilled. A classic pink princess phone. The one I has as a child. I will always love this phone – so a replacement will make this momma, happy. It is the only wired phone in the house. :-) I have it on my night stand. It makes me smile every time I see it. 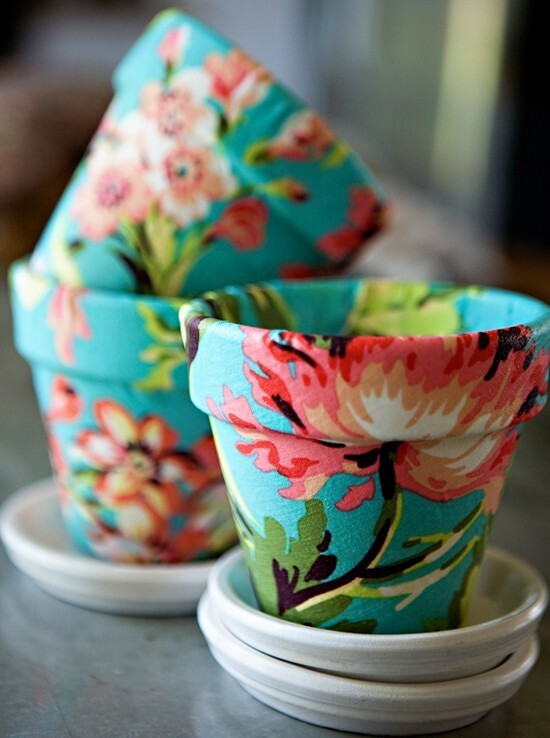 Grab some pretty fabric and Mod Podge to cover a flower pot bought at a garden center. Christine Chitnis made these pretty pots. No Fabric? Try covering a plain pot with book pages. Or gift wrap to transform a plastic pot into something decorative. From gift bags to sparkly embellishments, I love to wrap a gift so the receiver says Oooohhhh…la…la before they have even opened the gift. Whether you make it or buy your mother a gift this year, here are a few ways to inspire you to wrap your gift to mom in style. These are all such great inspiration. I so want that phone. I wish it came in a vibrant Lime Green also. The only phone connection I have is here in my little home office and it has a green Hyde A Bed Sofa in it… it is soooo old, but they just don’t make stuff sturdy any longer that I could afford, so I am keeping it. Loving these ideas, especially the chef coat! Can’t believe Mother’s Day is only 3 weeks away! I bought three of those acrylic frames at Goodwill for 99 cents each with the intention of making trays of of them. I bought a shopping cart FULL of stuff so I stashed the trays on the bottom rung of the cart and you guessed it…I forgot about them. I went back the next day, searched the store & couldn’t find them. I went back the third day and SUCCESS…I found them stashed with all the picture frames. So I got my 99 cent frames but not before I had purchased even MORE thrifted goodies on my second and third trip to Goodwill! FABULOUS IDEAS!!! I love the acrylic box frame idea! Very creative!